You’ll find MOLLE webbing on every modern tactical military backpack that is worth it’s salt. Sometime in the 1990s, the military decided to upgrade their backpacks. They were tired of the soldiers complaining about back pain from wearing their infamous ALICE packs. 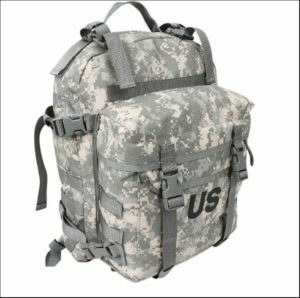 MOLLE pack is now the standard deployment pack of the U.S. military. 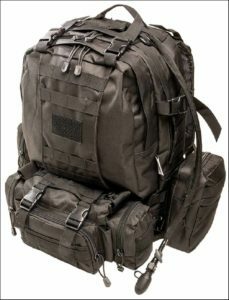 Private manufacturers – such as Blackhawk, Maxpedition and 5.11 Tactical – have also adopted the MOLLE system. It’s also a favorite among firefighters and police. What does MOLLE stand for? And why is it better than ALICE? What Is MOLLE And How Do You Use It? 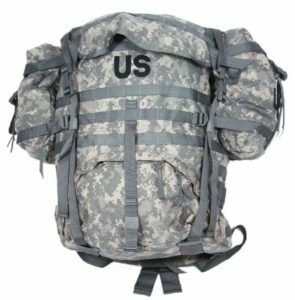 The name MOLLE (Modular Lightweight Load-carrying Equipment) comes from the straps/webbing that are covering the rucksack. Side Note: MOLLE webbing is also known as PALS – Pouch Attachment Ladder System. They’re the same thing. Making gear attachment simple and fast was one of the main ideas behind creating MOLLE. So, when you think MOLLE – think “adjustability”. You can attach additional gear to your bag’s exterior – wherever you have MOLLE webbing. Gear like: medical pouches, flashlights, holsters, magazine pouches, knife sheath etc. Most of that gear can be clipped to multiple connection points on the bag. But what else is good about MOLLE packs? Really – there’s a lot. Remember – I’m comparing MOLLE against its predecessor ALICE here. MOLLE attachments are extremely hard to rip off the pack. The pack is designed to avoid accidental loss of gear. Whatever you attach to it – it’s going to stay there. MOLLE packs are damn rugged. They are made according to military specifications from high tensile strength denier nylon. I don’t even need to mention the heavy zippers and reinforced stitching. Denier nylon is so strong, that back in the day they wanted to use it for bulletproof gear. It’s not as strong as Kevlar, though. MOLLE packs are built with comfort in mind. Especially for carrying heavy loads over long distances. This kind of comfort was not the case with the old ALICE bags. Inside a MOLLE bag, there are several locking pouches for keeping small items secure. 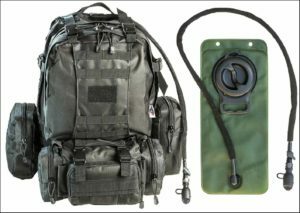 A hydration pouch (like camelbak) comes with most MOLLE bags. What that means is you’ll no longer need to carry a canteen to be able to drink. 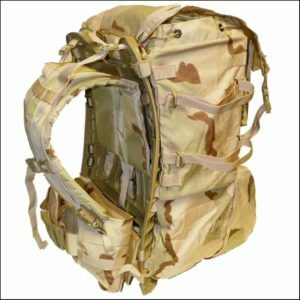 A rugged, mil-spec rucksack is one of the most versatile pieces of gear that you can have. Load it up with survival supplies and make it your bug out bag. Keep it on your car as a get home bag. Or go hiking, camping, hunting, and fishing with it. You can literally do anything with a MOLLE pack. Finally, MOLLE packs blow ALICE packs out of the water. Because it’s taller and has a waistbelt, MOLLE has a better weight distribution than ALICE. Not to mention that MOLLE packs are more customizable than ALICE. Finally – MOLLE is also lighter than ALICE.